Navigation on the Upper Paraguay river, between Cáceres, in Mato Grosso, and Porto Murtinho, in Mato Grosso do Sul, Brazil, has been a concern of many (see map below).1 In the late 1960s, the United Nations Development Programme (UNDP) funded a five-year study to collect hydrologic data on the Upper Paraguay, with the intent to use this data in future navigation development projects.2 The project was initiated in 1968, ending in 1973, with an expenditure of about U.S. $ 5 million. Yet the Upper Paraguay was not to be tamed. 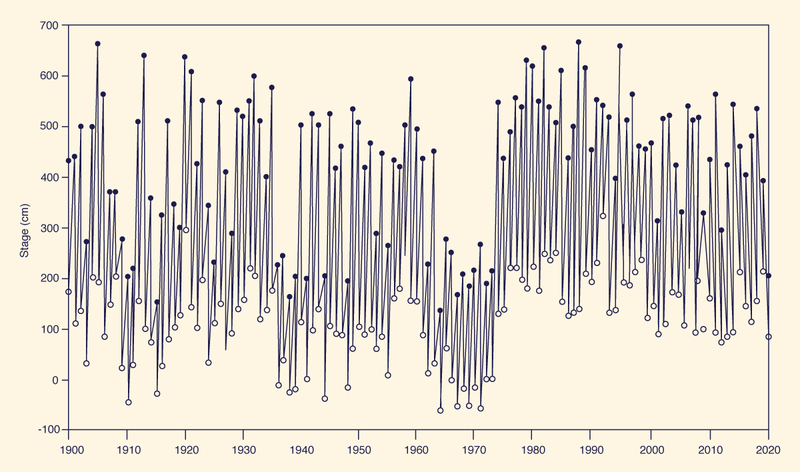 The river remained in drought from 1962 to 1973, the longest on record (see figure below). The untimely drought on the Upper Paraguay meant that the five-year study was only able to collect data during low flows. Thus, the moral of the story: "When dealing with the weather, be prepared to lose." 1 Ponce, V. M. 1995. Hydrologic and environmental impact of the Paraná-Paraguay waterway on the Pantanal of Mato Grosso, Brazil: A reference study. San Diego State University, San Diego, California, August. 2 Departamento Nacional de Obras do Saneamento (DNOS), Ministerio do Interior, Brazil. 1974. Estudos Hidrologicos da Bacia do Alto Paraguai (Hydrological Studies of the Upper Paraguay River Basin), Rio de Janeiro, in four volumes. Farolete Balduino, on the Upper Paraguay river near Ladario, Mato Grosso do Sul, Brazil. Historical (recorded) annual maximum and minimum stages, 1900-2008, Upper Paraguay river at Ladario, Mato Grosso do Sul, Brazil. 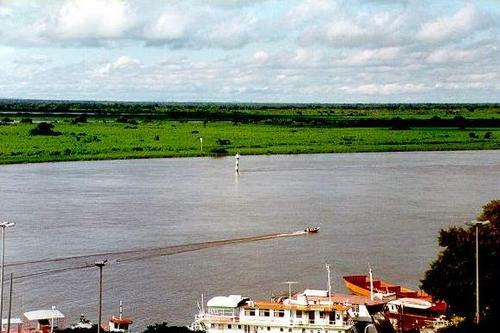 The Upper Paraguay river, from Caceres, in Mato Grosso, to Porto Murtinho, in Mato Grosso do Sul.